An invitation to attend an afternoon Pinot Noir release party afforded me an opportunity to plan a complete wine day tasting new releases from the Santa Rita Hills and Santa Ynez appellations. If I timed my day properly, I could fit in lunch at Los Olivos village and a tasting of new Richard Longoria wines before the Foley Estate event. 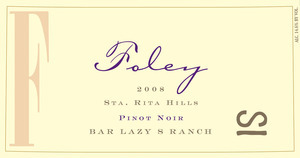 Foley Estate Winery, creators of some of California’s finest Pinot Noir and Chardonnay since the 2002 vintage was celebrating the release of their special “Brand” series and Lindsay’s Vineyard Pinot Noir, vintage 2009. 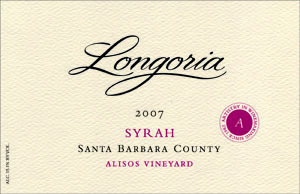 Having covered earlier vintages, their careful blending of clones within the 230-acre Rancho Santa Rosa Vineyard and Lindsay’s (formerly Rancho Los Hermanos) Vineyard, use of oak as well as fermentation techniques has pushed complex flavors forward and increased richness and texture with each vintage. An irony of the afternoon was finding time to sneak across from the tents to the tasting room to secure a few bottles of 2009 Foley Estate “Barrel Select” Chardonnay ($50), my hands down favorite. This Chardonnay delivers nice flavors of tropical fruit, honey, and vanilla within a creamy, rich texture. To paraphrase The Most Interesting Man In The World: “ I don’t always drink Chardonnay, but when I do, I prefer Foley Estate “Barrel Select”. However, this party is about Pinot Noir and the food that supports it, ready to showcase local restaurants. Oak influences are the signature of the 2009 Pinot Noir Rancho Santa Rosa Vineyard, lending earthiness to the bouquet and flavors. Some tannins and tartness add to the structure of a rich, concentrated texture. Perfectly braised beef short ribs from the Hadsten House Hotel, near the entrance of Solvang, accompanied the Foley Estate 2009 Pinot Noir, JA Ranch ($45), combining specific clones from the Rancho Santa Rosa and Lindsay’s Vineyards. Typical Pinot elegance was evident on the nose and the earthiness was balanced with hints of vanilla, anise and a very soft texture. Offering many luxury amenities at reasonable prices, the Hadsten House has been a true “find” in the Solvang area. It is family friendly, offers a true gourmet breakfast and, now has an on-site restaurant featuring traditional dishes of chicken, salmon, chops steaks and a wine list continuously updated to feature the best the region has to offer. I can tell you that their well-spiced short ribs fell off the bone. ” has a variety of strong spices including cloves, brown sugar and cinnamon delivered through a velvety texture that lasts and lasts. This is a good wine to track throughout the year. medium-bodied wine with classic black cherry flavors preceded by a candied nose. The wine was accompanied by cannellini beans with Italian sausage, black and white pepper, pairing nicely with the toasted nut hints on the finish. Whether red or white, the Foley “Barrel Select” concept blends the most complex and complementary barrels after the fermentation and aging process. A high percentage of the juice completes a malolactic fermentation process that adds to the softer, rich texture. Fantastic Boneless Baby Back Ribs with Pressed Casaba Melon and Tomato Salad, for me, could pair with almost anything, including the 2009 Foley Estate Pinot “Barrel Select” ($60). With a slight bouquet and traditional flavors, the complexity of this wine is nicely packaged in a creamy texture and long finish. The 2009 Two Sisters Pinot Noir Lindsay’s Vineyard ($75)is comprised of the best clones within the vineyard, blended after individual aging in 90% new French oak barrels. With nice floral hints on the nose and caramel, cinnamon on the finish, “Two Sisters” has all the layered flavors and texture expected from a wine in the higher price range. The Foley’s daughters are placed in a prominent role throughout their family of wines. After acquisition, the westerly Rancho Hermanos Vineyard was divided into two distinct vineyards and renamed for the sisters, Lindsay for the reds and Courtney for the whites. Both “Two Sister” wines are carefully crafted, but the Pinot Noir will need lengthy cellar time. Another Foley family operation, Lincourt Winery, located in the Santa Ynez Valley near Los Olivos village, combines the sister’s names for its own. Adding sauvignon blanc, pinot grigio and cabernet sauvignon to the traditional pinot noir and chardonnay, Lincourt offers a palate of reasonably priced, quality wines. 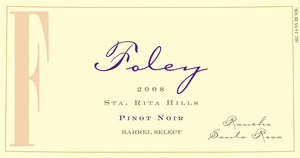 The Foley Estate Winery, under the leadership of winemaker Leslie Renaud, is producing luscious high-end Pinot Noir and Chardonnay in a region known for it, within a state that leads the world. There are simply many to choose from. For those interested in “stepping up” their wine experience a notch, I feel that the Captain’s Club” would be both informative and fun. Although I am not a member, I do know that their wines are really getting good, the winery resides in a serene valley located off Highway 246 and they always host multiple events for the member’s enjoyment. nineties, the vintage 2008 “Fe Ciega” has gotten great press, convincing me to acquire a few bottles to cellar for at least a year. In the garden, we began with a vintage 2010 Albarino ($23), offering some soft tropical fruit with a citrus “kick”. A nice wine, but with all the chardonnay, sauvignon blanc, viognier and white Rhone-style blends saturating the market, one wonders where this Spanish white grape will fit in. 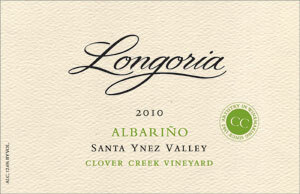 2010 Longoria "Albarino" a white Spanish grape. cabernet sauvignon. Having first tasted the 2008 Longoria Tempranillo Clover Creek Vineyard ($36) months earlier at a private tasting in Glendale, I was anxious to discover if my initial positive impressions were justified. Once again, the somewhat earthy bouquet and flavors were enhanced with nice structure and texture, aided with hints of Merlot and Syrah. I would definitely select this vintage from a wine list to pair with red meats or pasta. Syrah Alisos Vineyard Santa Barbara County ($34), even if somewhat acidic, expressed wonderfully balanced spice and berry flavors. Although it is drinkable now, this wine definitely needs time to optimize. For those who have access to wild meats like venison or boar, this syrah would pair perfectly. 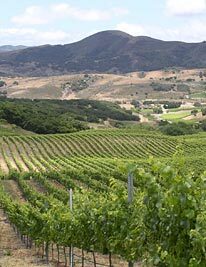 The thought of ten new and interesting wines, a few for my cellar, boneless baby back ribs with pressed casaba melon and tomato salad and an opportunity to spend a day amidst the new California landscape; oak-studded rolling hills and vineyards has me already wanting to do it again. This entry was posted on Monday, September 5th, 2011 at 10:00 pm	and posted in 2008 Longoria "Fe Ciega Vineyard" Pinot Noir, 2008 Longoria Tempranillo Clover Creek Vineyard, 2009 Foley Estate "Barrel Select" Chardonnay, 2009 Pinot Noir Rancho Santa Rosa Vineyard Pinot Noir, braised beef short ribs, Foley Estate 2009 Pinot Noir, Foley Estate 2009 Pinot Noir Bar Lazy S, Food, JA Ranch, Longoria 2010 Albarino, Rancho Santa Rosa Vineyard, Santa Rita Hills, T Anchor Ranch, Wine. You can follow any responses to this entry through the RSS 2.0 feed.